An excellent and popular variety pack, a way to try several fragrances at once. Fragrances included: #2 Oils & Spices, #4 Orchards & Vines, #10 Herbs & Flowers. 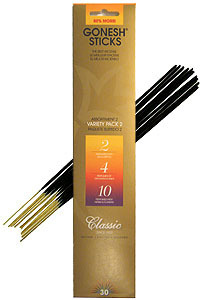 **NEW LARGER PACKAGE contains 30 sticks of high quality charcoal incense (10 sticks of each scent).